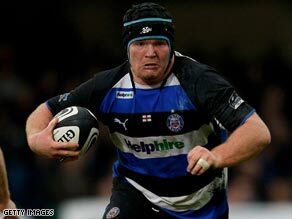 (CNN) -- Bath and England prop Matt Stevens has received a two-year ban for failing a drugs test. Stevens has been banned for two years after testing positive for cocaine last December. Stevens was handed the "prescribed sanction" at a European Rugby Cup disciplinary hearing after metabolites of cocaine were found in his system. Stevens, 26, has been banned from all rugby and rugby-related activities until January 18, 2011 and Bath have announced they will hold an internal hearing with the player. Bath chief executive Bob Calleja explained the club would seek to hold talks with Stevens as soon as possible. "As far as the club is concerned we have to follow due process, which we have done," Calleja told Sky Sports News. "We will now hold our own internal meeting with Matt and make a statement after we've done that. "I'm hoping to speak to him as soon as possible and continue the dialogue now that we know what the conclusion is." Calleja acknowledged the length of the ban was to be expected. He said: "It doesn't come as a particular surprise, looking at the precedents that have been set." Stevens failed the drugs test after Bath's 25-19 Heineken Cup victory over Glasgow on December 14. After being informed of the result, Stevens made a tearful public confession and revealed he had developed a problem with drugs. Stevens, who has won 32 Test caps, was immediately removed from England's Six Nations squad pending the outcome of the hearing in Glasgow. He had been expected to make the British Lions squad for this summer's tour to South Africa and he could have been one of England's most experienced players come the 2011 World Cup in New Zealand. A spokesperson for Stevens told PA Sport: "Matt has pleaded guilty and chosen not to appeal the decision and accepts full responsibility for his actions. "He would like to again apologize to everyone that has been involved in his career at Bath and England, his team-mates and rugby fans for letting them down. "He would also like to thank all those who have supported him through this time and intends to return to the game a better person and rugby player." England manager Martin Johnson said: "I have said all through this episode that there is no place in sport or society for illegal drug use. "Matt chose to take a banned substance and will now have to accept the consequences. He will not be involved in rugby for two years and for a professional sportsman that will be a very tough experience. "Matt has admitted that he has a problem and is seeking help. We support him in that but all rugby players must understand that they are responsible for their actions, and that includes lifestyle choices."